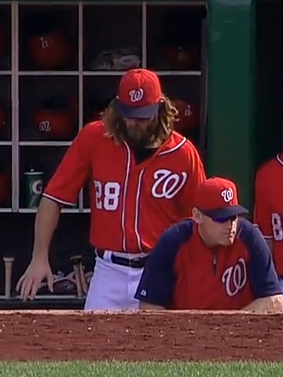 The Nats haven’t had to worry about too much the last few days, other then getting guys their rest… but not too much rest! The biggest decision they’ll have to make before the playoff game, other than practice schedules, will be the NLDS roster. Of course I’ve got a take on it, so here we go. Keep in mind I’m not projecting the roster here, I’m giving you my Nats NLDS roster. Next to their names I’ve written something about them. Most of the time it’s relevant to the conversation! 4. Gio Gonzalez – Since returning from the DL he’s started 18 games and has a 3.08 ERA. His arm has fewer miles on it this year than the other guys. I’m comfortable with a 4 man rotation in the NLDS. 7. Adam LaRoche – I hear the Nats have a beard thing going, is this true? 11. Bryce Harper – .814 OPS since the All Star Break. Did you realize he is younger than this article? 12. Denard Span – WAR might not reflect it, due to the fickleness of defensive metrics, but I’d probably call him the Nats second best position player this year. Ok maybe third. Whatever, he’s been great. 22. Jerry Blevins – Ineffective against righties this year, he is poison to lefties. They are hitting .160/.202/.217 against him. 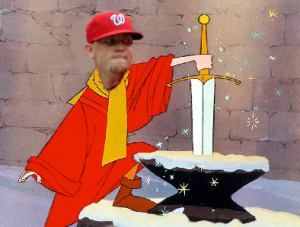 I laid it out earlier this year, and Matt Williams has used him curiously this season, but he is my #1 go to guy to get a lefty in a big situation. 24. 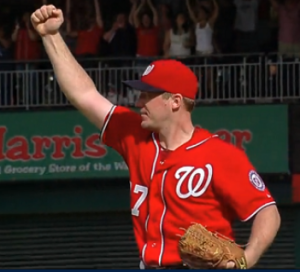 Blake Treinen – I considered Craig Stammen here, and I’m not sure which one to take. Stammen has been coming out of the bullpen all year and he’s a veteran presence at this point, but, like Schierholz, on the margins I’d prefer the good player than the guy who knows his role. Treinen’s numbers are great, if lucky, this year, so I’ll take the chance that he can handle the spotlight. I’m still not convinced. 25. Aaron Barrett – Other than a crappy July, possibly crappy due to a bad back that landed him on the DL in August, Barrett has a 1.54 ERA in 35 innings this year. Also he is the lead singer of nostalgically bad 90s band Reel Big Fish, who covered Take On Me. Life is a ska-punk powered circle. What’s past is prologue.